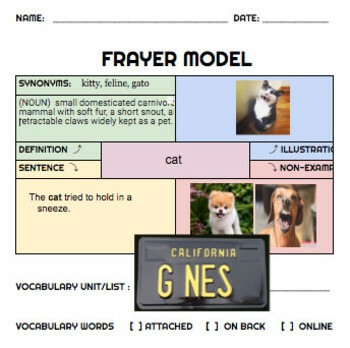 The Frayer Model is a graphic organizer used for word analysis and vocabulary building. 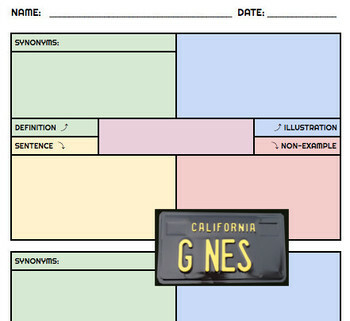 This four-square model prompts students to think about and describe the meaning of a word or concept by . . .
Offering non-examples of the idea. Good for all grades, whether the words are "cat, hat, and bat", or "anachronistic, empathy, and perfidious." The supplied template allows for manual use (pencil) or digital use (online), allows for a selection of up to 20 words (students are responsible for all or selected words), and includes personalized instructions based on teacher need. Perfect accompaniment for spelling or vocabulary words. ELD strategy. 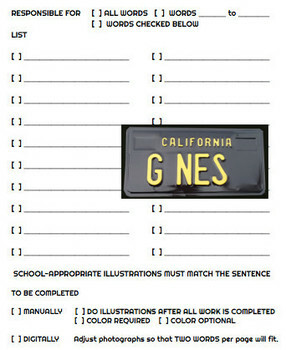 Great for sight words, science/math glossaries, and words found in class book. My use (recommended): share the document with a group of students and allow them to share and build one complete document for a "jigsaw" approach. This is the easiest method for teachers who want to print and display the work. Your digital copy includes COLOR version and BLACK AND WHITE version. © G-NES. All rights reserved by author. By purchasing this item, you agree you are buying a single classroom/teacher license, which does not include the copyright. This product is to be used by the original purchaser ONLY and is a one classroom license. It may not be posted on a public website where others have access to download it, it may not be resold, donated or given away and it may not be translated into another language and then posted for free or for sale.